NOTE: This report was published in December 2016. You can find the August 2017 Report at this link. Network functions virtualization (NFV) is considered by operators and vendors alike to be the most important transformation that the network industry has undertaken in its history. NFV promises to provide operators with the ability to deliver increased service revenues, automate many, if not all, network functions, reduce the cost of the infrastructure needed to support new services, and provide the scale needed to meet exploding traffic demands. The next-generation service delivery architecture requires an effective network infrastructure that supports network functions and services with typical carrier-grade attributes such as guaranteed SLA performance, reliability and elastic scaling. 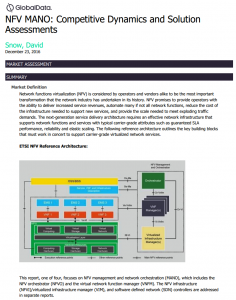 In this report, GlobalData Analyst David Snow builds a market assessment of various NFV MANO solutions based on specific, actionable criteria. See why Cloudify’s orchestration framework received a “Very Strong” overall rating, including being among the top in production NFV deployments. Just enter your information in the form and get the free report!